We hear time and again how John Faso has failed to be at town halls, to respond to his constituents, and to do what he was elected to do: Serve us. Now, perhaps Faso’s actually afraid to drive the roads around here, because as we all know, they’re absolutely falling to ruin. So what is Faso’s response? Not to show up. Not to actually be here when Congress is out of session, not to drive our crumbling roads and demand repairs and upgrades, but to devise a sham of a bill with the title “infrastructure” in it, hoping none of us will read the fine print. Well, we did read the fine print of the cynically named Infrastructure Expansion Act of 2017, which does no such thing. What does it do? It shreds the 1885 New York State Scaffold Safety Law. Why? Because that law says that the employer on any worksite is responsible for protecting workers, and can be held liable when they fail to do so. And it dates that far back because so many workers were being killed and maimed on construction sites that even in an age when that was the norm, lawmakers in the state at the time realized something had to be done about it. Clearly John Faso doesn’t know his constituents, or how many of them work in construction, and has never ridden a 6am Metro North train south, where the train is half full of folks toting hard hats. They can’t afford to live in any of the gazillionaire’s apartments they’re building, so they live far up the Hudson, frequently in Faso’s own district. That’s right, very simply John Faso wants to spread the safety burden to people who work in construction, on the job sites, even though if you’ve ever been on a construction site you know darn well labor has almost zero control over how safely the site’s run. And if you pass a law that allows contractors to worry less about worker safety, because their lawyers would now get to fight the lawyer the laborer could afford, guess what happens to job site safety? 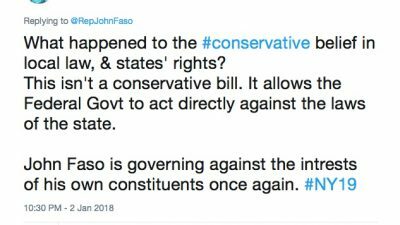 The context is possibly even more galling, because once again this is John Faso stomping on the rights of all New Yorkers to make their own laws. He did it on guns, and now he wants to erode the safety of hard workers in his own district, by undermining state law with federal law. And here’s the thing: There’s no proof that contractors are having to foot a higher bill as a result of this law. And you know why? Because every year they oppose a bill that legislators put forth in the Assembly to force them to reveal how much they’re paying for premiums. Second, the facts about construction workplace hazards: A newly released report found that over the past five years, the fatal occupational injury rate statewide in New York increased by 29.5 percent. And in 2017 alone, 71 construction workers were killed on the job. Clearly, though, Faso doesn’t care. Returning to a final point, about states’ rights, guaranteed by the 10th amendment to the U.S. Constitution, which John Faso swore to uphold (Faso, however, had trouble even getting into law school; he was rejected by seven of them), it’s profoundly disturbing that instead of helping NY19ers get jobs, or be safe on the job they have, he’s actively working to make our lives more dangerous. That’s what a national concealed carry law would do, and that’s what this law would do. An addendum: The member of Congress responsible for advancing Faso’s anti-worker bill is Bob Goodlatte, an historic champion of states’ rights. He opposed everything from Obamacare to federally imposed taxes on Internet products because in his view, these laws violate states’ rights. In 2015 a very conservative blog wrote an incredibly fawning catalogue of all the times Goodlatte had stood on the side of states’ rights. So you have to ask: Is Goodlatte conveniently forgetting his principles? Better question: What principles! Goodlatte voted for the same concealed carry bill that Faso voted for—the same bill that allows states with weaker gun laws to impose them on states with stricter ones. Of course he’ll push Faso’s agenda, because remember: Conservatives like these demonstrably don’t have any principles, they just advance the agenda of the NRA, and whoever’s lining their pockets. This week it’s the construction industry. Will these members of Congress ever come around to voting for the rights of their constituents? Let’s not hold our breath. Let’s kick them out of office instead.